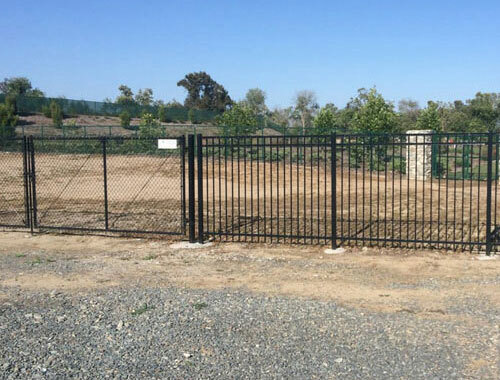 Orange Coast Fence Company is the best fence contractor in Orange County for industrial, commercial and residential iron fences and gates. Our iron fencing is made from high quality tube steel that is powder coated for rust resistance and expertly designed and constructed for maximum durability, functionality, and longevity. Having decades of fence construction experience means that we know how to build iron fencing that always meets the highest of standards. As a testament to our superior service, quality craftsmanship, honest business practices, and competitive pricing, Orange Coast Fence has thousands of satisfied clients throughout Santa Ana, Huntington Beach, Costa Mesa, Irvine, Westminster, Garden Grove, and surrounding areas, and receives the majority of its work from returning clients and referrals. Iron is one of our most popular fence options because it can be designed to meet nearly any fencing need, whether its a homeowners association needing a code-compliant pool fence, a warehouse needing a sturdy security fence to keep out trespassers, or a homeowner wanting an elegant fence and rolling driveway gate to delineate the perimeter of their property. Our iron fences, sometimes referred to as wrought iron fences, are available in three styles -- the Regal, the Aristocrat, and the Guardian -- to accommodate a fairly broad range of aesthetic preferences and functional requirements. Our beautifully designed, well-constructed iron fences feature 2" by 2" posts with 1"-1 ¾" pickets and 1 ½" top and bottom rails, and are made from powder-coated, pre-galvanized steel. Our standard powder coat finish is black, but we can have your fence powder coated in any color you want. For additional customization, our customers can also choose the size and thickness of the iron and gauge of the pipe. 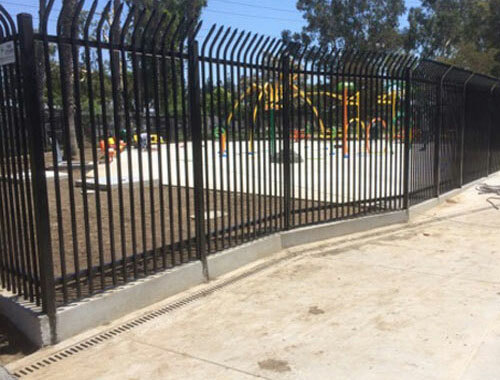 Orange Coast Fence Company also offers the best value in iron fence repair and replacement services in Orange County. Not only do we offer reliable construction at competitive rates, but we're also always looking for ways to help our customers save money. For example, if a customer has an existing wrought iron fence that is mostly in good condition structurally, we can cut out and replace those damaged or corroding sections with new iron rails and pickets, rather than replacing the entire fence. Like our new installations, when replacing sections of iron fencing, we typically use brackets in order to avoid damaging the finish of the surrounding fence; however, we could weld on site if necessary. If an iron fence is beyond repair or if a complete replacement would be more cost-effective, we notify the client during our initial consultation. 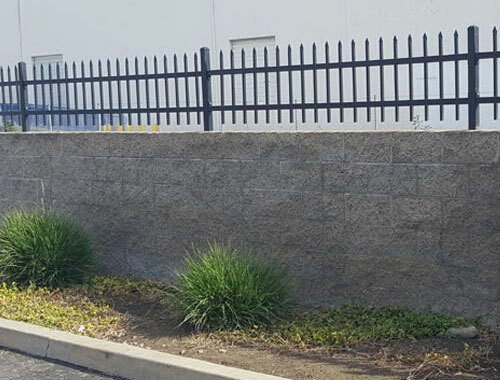 Whether you are interested in an iron fence to keep your home, warehouse, or business secure, you can call the experts at Orange Coast Fence Co. to ensure you get a quality fence at a great price. We are fully licensed and insured, and stand behind our workmanship with a one-year warranty. If you have a clear idea of what you want, our staff can usually provide an over-the-phone ballpark estimate. For those needing a more accurate quote, we offer free on-site consultations and estimates with our owner, Doug, who has more than 40 years of experience. By working with our experts, you can rest assured that your fence will installed successfully, comply with local building codes, and fully meet or exceed your expectations.